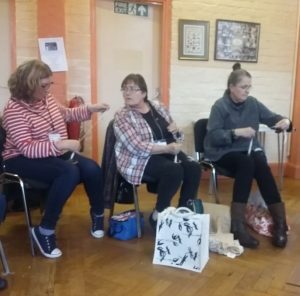 A group of our talented weavers enjoyed the opportunity of attending a Double Weave course tutored by the renowned weaver Riitta Sinkkonen Davies who had travelled from her home in Pembrokeshire. You may remember Riitta being the guest speaker when we held an Open Day in September 2014. Her description of her work with linen was fascinating and included details of her many commissions including the weaving the fine linen cloth used to make the rochet worn by Rowan Williams for his ordination as the Archbishop of Canterbury. Some of the group also attend Lostock Weavers organised by Jane Flanagan. 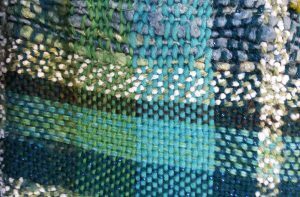 Jane is a well known North West weaver who is a regular contributor to the British Fibre Art magazine. There is a feature in Issue 12 (November/December2018), available in our Guild library, about the ‘Bountiful’ Exhibition held in October 2018. The article contains photographs of work by our Guild. Lostock Weavers Group meet at Lostock Parish Centre Tempest Road Lostock Bolton BL6 4EL. note the labels...you won't remember! 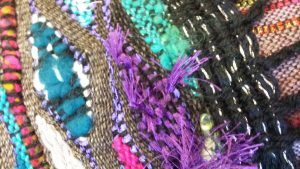 At our March meeting we were delighted to welcome the textile artist Patricia Greaves, who is now predominantly a feltmaker. 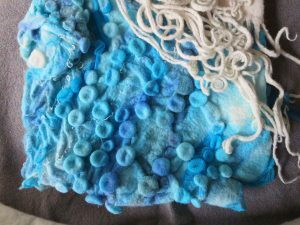 Patricia takes much of her inspiration from the sea and coast, particularly enjoying her ‘local’ beach at Ainsdale. Patricia has developed her ideas into exhibition installations and displays including a ‘walk-through’ installation. Initially a painter, her exhibition and display pieces feature ’etching’ on perspex, printing on aluminium and during her ‘white phase’ working on brown paper with pastels and crayon. We were certainly given plenty to think about including the use of technology to produce panoramic pictures (on your phone) and wonderful photobooks. Most gadgets have a simplified version of Photoshop these days (or you’ll find an app to do it!) with which to edit and enhance your photographs...give it a go. As well as a photographic presentation we were treated to a display of Patricia’s work including large felt panels, a triptych and a creation from painted and folded fabric. 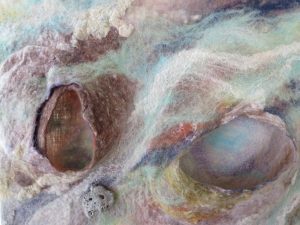 Her work includes several felt disciplines: nuno, gossamer, needle-felting and 3D work. 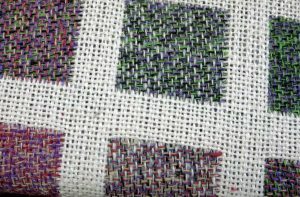 She hopes to develop her inspirations into woven pieces. Patricia is a member of Merseyside Guild and gives workshops in the area. 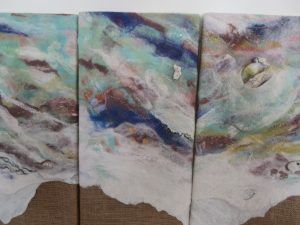 Many more examples of her work may be found on her website https://art-felt.com/ and on her Facebook page. 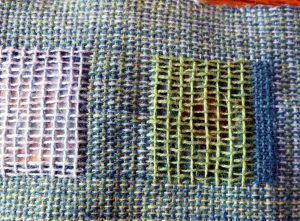 Delighted to welcome former Guild member Bee (Beryl) Weir who delivered her talk ‘Freestyle Weaving’ and a ‘Wavy Weaving’ workshop. Bee cleverly involved her audience by dressing them in a wrap or providing a piece of weaving to be displayed and then presenting a ‘fashion parade’. A very varied selection of her woven wraps, ponchos, stoles and scarves was demonstrated and explained. 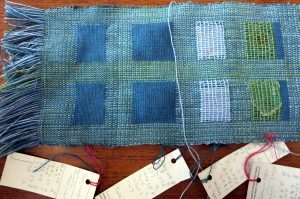 Bee was anxious that her audience grasped her principle that the loom does not dictate what you are making, you are producing a fabric which can be sewn, folded, cut and shaped like any other. 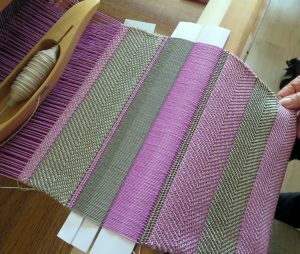 A simple rigid heddle loom can be utilised in a variety of ways and narrow weaves can be sewn together. 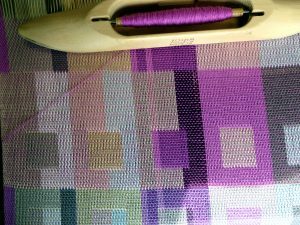 Using mixed heddle sections enables one to use a variety of thicknesses of yarns, including ‘pom-pom’, in the warp. 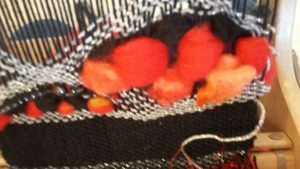 Mixing feltable and non feltable yarn can produce a stunning effect when felted. 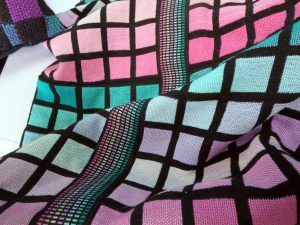 Additional heddles make the production of double weave or pocket fabric possible. 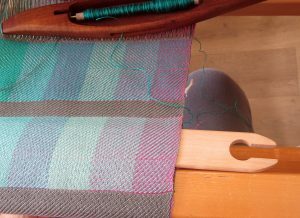 Clasped weft technique gives very pleasing results and for extra interest a plainish fabric could be dyed after weaving. Nothing need be wasted. Offcuts can be made into hats, bags, placemats etc. 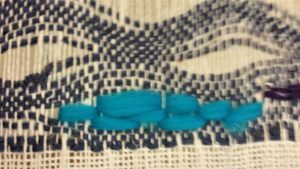 In the afternoon participants had brought their looms warped up and ready to experiment with wavy weaving. Bee had designed the shuttle (which is available from her on line shop http://craftsfromthedungeon.com/shop new business name is Crafts from the Clink) which creates waves in the weaving later filled in with a contrasting yarn. Our programme sec, Ann, had used her networking skills to organise a visit by Amanda Hannaford. Amanda’s travel expenses from Cornwall may be prohibitive for smaller Guilds so Leek, Stratford and North Cheshire had shared the cost and Amanda had made visiting the different Guilds part of her holiday. 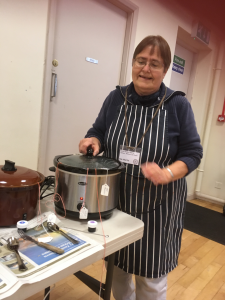 We were able to hire the delightful village hall in Dunham on the Hill (a lovely, rural setting but an easy journey from the M56) and with the aid of Judy,Liz, Margaret and Karen for accommodation and victuals all was prepared for an intriguing talk and workshop. The day began with ‘Whorls around the World’ featuring Amanda’s immense collection of spindle whorls. What an enormous variety: some spindles have integrated whorls in various shapes, whorls may be located top, middle or bottom of the spindle with different sizes, shapes and weights depending on the fibre being spun. As well an an enormous assortment of shapes the whorls were made from many materials: clay (both glazed and unglazed), lead, copper, bronze,ivory, stone, glass, shells, fossils, wood and iron. To add even more variety they could be decorated, carved and etched to produce intricate patterns. The fact that every centimetre of fibre needed for household items, hunting equipment and clothing had to be produce by the user needs to be considered when attempting to age the craft of spindle spinning. Amanda cited an example of evidence from 3000 BCE from Bronze Age Anatolia. This evidence was a drawing thought to represent spinning. 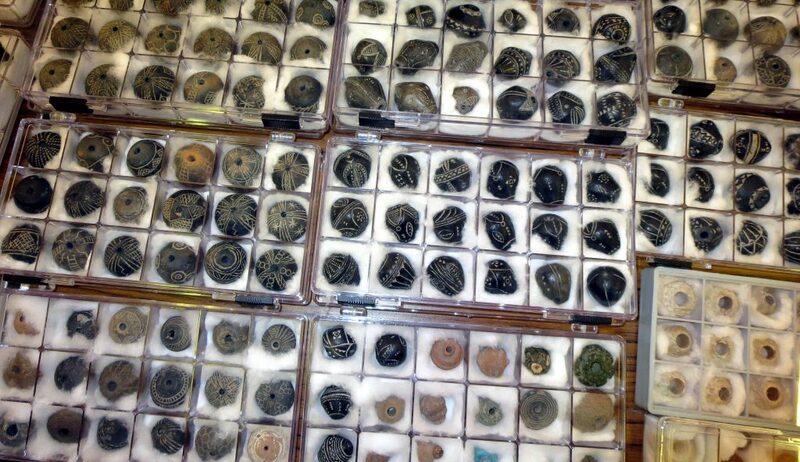 Archaeologists haven’t always recognised whorls when examining ancient burials, they have been thought to be beads. It is perfectly possible that spindle spinning dates back to Stone Age. There are many BCE examples of whorls from cultures in Central and South America. An examination of the Venus de Milo's musculature has revealed that she may well have been spinning! Suspended spindles are so named because they are suspended to swing from the yarn after rotation has been started. Drop Spindles are a popular type of suspended spindle and get their name because the spindle is allowed to drop down while the thread is formed, allowing for a greater length of yarn to be spun before winding on. Suspended spindles also permit the spinner to move around while spinning, going about their day. Supported spindles continue to rest with the tip on one's thigh, on the ground, on a table, or in a small bowl while rotating. Supported spindles come in a great variety of sizes, such as the very large, ~30" Navajo spindle, the small, extremely fast, metal takli for spinning cotton, and the tiniest Orenburg spindles (~20 cm, 15gm) for spinning gossamer lace yarns. Grasped spindles are also known as hand spindles, in hand spindles and twiddled spindles. 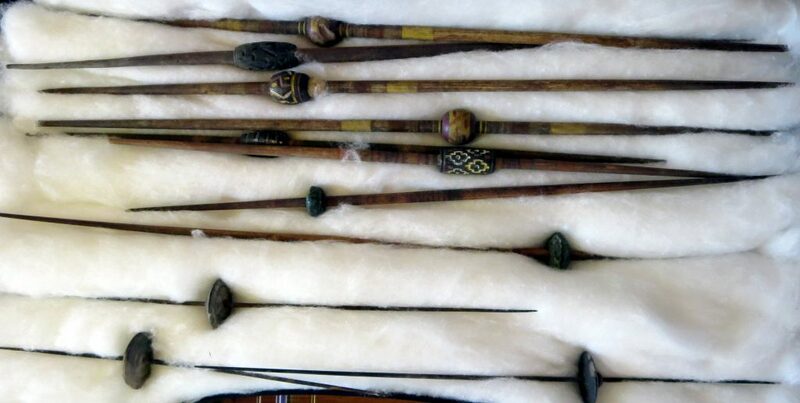 Grasped spindles remain held in the hand using finger or wrist movements to turn the spindle. French spindles are "twiddled" between the fingers of one hand while some types of Romanian spindles are grasped in the fist and turned through rotation of the wrist. 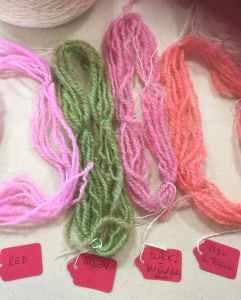 This was a re-run of the dyeing day in June run by Mandy and Janet with the mysterious addition of 'Quick Dyeing in the Slow Cooker' by Ann M.
1. Take a small loose skein of animal fibre yarn or washed fleece and put it into a bowl of hot water, with a cup of white vinegar or some citric acid crystals. The acidity allows the dye to be taken up into the fibres. Leave for about 15-20 minutes. 3. Set up the slow cooker by adding water and more vinegar. Heat cooker on high for a few minutes until water is hot. 4. Decide on your colour. Will you add one or several together, mixed or separate? Once you have chosen then use a cocktail stick to add ONE drop of Wilton Food Gel into the water in the slow cooker. CARE NEEDED. These dyes are concentrated so add dye carefully. 5. Drain the acidic yarn and transfer to the slow cooker. Gently push it under water to cover but DON’T STIR. 6. Wait until the water is clear. Usually it’s only minutes, depends on the temperature. This means that the acid has picked up all the dye from the water and locked it onto your yarn. 7. Pick out the yarn and wash in water. 8. Spin in a salad spinner to remove moisture. 9. Hang up to dry. 10. Enjoy your specially dyed yarn. Ø Note: Black, Violet and Dephinium dyes will split into their constituent colours .This makes it more interesting! Ø Green and some blue dyes don’t exhaust quickly so you may have a wait. Ø Experiment with greasy fleece as the grease inhibits the dye , a bit like Batik or wax resist. You’ll get blotchy dyeing. This method is quick enough to experiment with and rarely gives you repeatable dyeing so it’s very exciting.